This tour is perfect for those who are planning on staying the night at lake kawaguchi-ko. The tour will take you to Mt. Fuji 5th station, and the Fuji world heritage center. Afterwards you will head on to lake kawaguchi-ko, where the tour will dismantle. This is an affordable and easy way to get to kawaguchi-ko, while also getting the chance to checkout Mt. Fuji and the surrounding area. Mt. 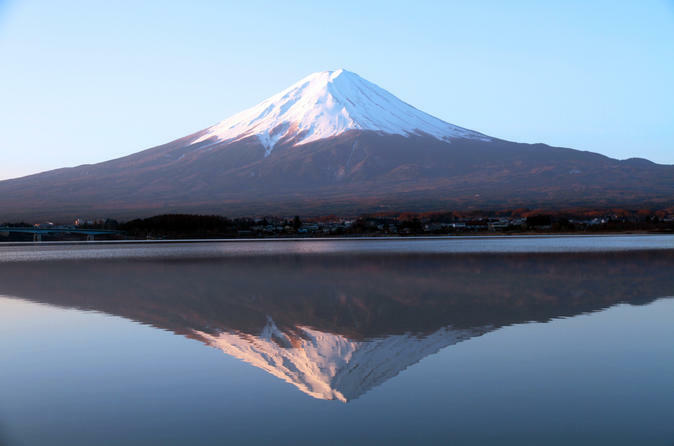 Fuji is a world heritage site and a symbol of Japan. The 5th station especially, is a popular spot amongst visitors because you can enjoy the fresh air and beautiful scenery of Mt. Fuji even if you're not a experienced climber. You will first go to the Mt. Fuji world heritage center, where the value of Mt Fuji as a World Heritage is explained to local visitors as well as to travelers from abroad. The centre of the main exhibition room features a large replica of Mt Fuji made of 'Washi' (Japanese paper) that is 15m in diameter. It acts as a 3D projection screen and shows Mt Fuji changing with the seasons. Next, you will take a walk to the Kitaguchi Hongu Fuji Sengen-jinja Shrine. This shrine is considered a 'power spot' (spiritual spot, one where you can feel in-tune with nature or the surrounding elements) in Japan. The goddess of Mt. Fuji, Konohana-sakuya-hime-no-mikoto, Hikoho-no-ninigi-no-mikoto, and Ooyamazumi-no-kami are worshipped here. The next and last stop is lake Kawaguchiko. You will be dropped of near the lake area or the Kawaguchi-ko station. Lake Kawaguchiko, the second largest out of the 5 Fuji lakes. You can see the famed reflection of Mt. Fuji. when the surface of the lake is calm and still. Lake Kawaguchiko also offers a variety of colors that changes with the seasons. Pink Cherry blossom in spring, Purple lavender in summer, Momiji (red leaves) in autumn, and the Silver Forest Festival in winter. There are many restaurants surrounding the lake that offer a variety of meals from Udon, Tempura to even Halal. There are also plenty of hotels to choose from.